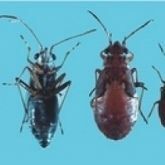 Rutherglen bug (RGB) and grey cluster bug are native species that can migrate into crops in very large numbers in favourable seasons. 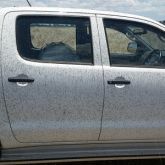 Rutherglen bug is widespread, while grey cluster bug is only a pest in north-eastern Australia. Both species breed on a wide range of native and weed hosts, building up to large numbers in inland areas when winter/spring rainfall promotes growth of native herbs and weeds. In spring, as these hosts dry off, large numbers of adults will migrate on storm fronts into eastern cropping areas. clear wings folded flat over the back. wingless, with a reddish-brown, pear-shaped body. Use a hand lens or microscope to distinguish between species—RGB looks smooth, while grey cluster bug is hairy. Nymphs are often confused with aphids. Rutherglen bug is common in New South Wales, Queensland, South Australia, Victoria and southern Western Australia. Grey cluster bug is common in northern New South Wales and Queensland. Wide host range, including many weed species. Crops most commonly affected include sunflower, sorghum, canola and safflower. 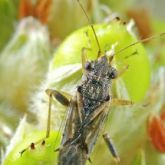 In years of heavy infestations, the bugs can also be found in other crops, including wheat and legumes. Infestation during grain set and grain fill reduces yield, oil content and oil quality, and seed germination rates. Damaged grain is more prone to fungal and bacterial diseases. In sunflowers, heavy infestations during budding may cause heads to wild and distort. In sorghum, very early damage looks like sorghum midge damage. Impact is greater in moisture-stressed crops. Females lay up to 400 eggs. In spring and summer, development from egg to adult takes 3–4 weeks. Adults live up to 4 weeks. In cropping areas RGB breed on weeds, moving to available crops or weeds when hosts die off. In seasons when RGB is a major pest, the population is dominated by migrants from inland breeding. Sunflower and other oilseeds: from budding onwards. Sorghum: from head emergence to physiological maturity (black layer). Bugs populations are often patchy. Egg parasitoids of RGB have been recorded, but are unlikely to provide significant control in high population seasons. Predation has rarely been recorded, but spiders may play a role. Local management will have little impact on RGB in seasons of high migration. Managing weeds in and around paddocks prior to sowing can reduce local bug movement onto emerging seedlings. Repeated influxes of migrating adults can make repeat applications necessary. Nymph movement around the plant may also limit pesticide contact, so insecticides with higher residual values may be more effective in these situations.